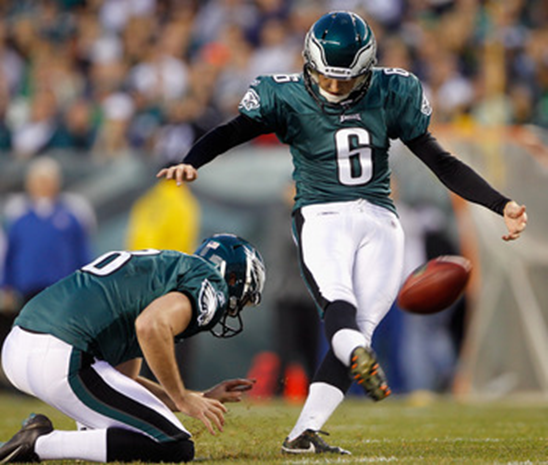 Alex Henery has converted 35 of his last 36 field goal attempts with the Eagles. You can’t blame Alex Henery. There’s a very short list of Philadelphia Eagles who can look themselves in the mirror and feel like they’ve done all they could during this wretched 2012 season. DeMeco Ryans. Evan Mathis. LeSean McCoy. Fletcher Cox. Hmmm. We said it was a very short list. No doubt Henery would be on there, though. It’s pretty lame when your team MVP could be a 175-pound placekicker, but Henery has been nearly perfect this year and really since he got here as a rookie fourth-round pick out of Nebraska last year. Henery missed his second field goal attempt on opening day in Cleveland and has made 19 straight kicks since, breaking the franchise record of 17 consecutive field goals set by David Akers during his 2001 Pro Bowl season and matched last year by Henery. Is it the longest streak of his life? Good luck finding out from Henery. “Honestly, I really don’t know,” he said. “I don’t really pay attention to all that stuff. I don’t remember my stats very well. Henery converted his last 16 kicks last year, which means he’s made 35 of his last 36 field goals, which is 97 percent. • He’s made 44 of 48 field goal attempts as an Eagle, for 91.7 percent. He doesn’t have enough attempts to qualify for the all-time leaders – the NFL requires kickers to make 100 field goals before they can be considered for record purposes – but based on guys who’ve made 25 or more field goals, he’s the most accurate kicker ever, just ahead of Dallas’s Dan Bailey, who the Eagles will see Sunday night. Bailey is 54 for 61 for 88.5 percent. • Henery has made 20 of 21 kicks this year, which is 95.2 percent accuracy. If the season ended today, that would be the 12th-highest figure in NFL history. • After making an NFL-rookie-record 88.5 percent of his kicks last year, Henery is on pace to become the first kicker in history to make 88 percent of his kicks in each of his first two NFL seasons. • Henery is the most accurate kicker in NCAA history, going 68 for 76. That means since leaving high school, he’s 112 for 124, or 90.3 percent. He made 18 of 19 as a senior at Nebraska, so he’s 62 for 67 over the past three years (92.5 percent). • Henery is 13 for 14 (92.9 percent) in the crucial 40-to-49-yard range. And how much does all this stuff mean to him? Henery is non-plussed when asked about his consecutive field goal record. He’s non-plussed about pretty much everything. “That’s not one of those things that I look at,” he said. “It’s a cool honor, but I have to concentrate on the next kick, not the last one. That will be up to the fans, coaches and players around the league, but Henery has a shot. Henery leads the NFC at 95.2 percent, with Vikings kicker Blair Walsh and Bailey next at 92.3 percent (24 for 26) and 91.7 percent (22 for 24), although they both play in domes. David Akers went to five Pro Bowls during his 12 years with the Eagles and a sixth last year with the 49ers.